At the end of last season we had a lot of tomatoes which unfortunately didn’t ripen. So in an effort to make some Lemonade from these “lemons”, I searched for a recipe that used green tomatoes. I came across this great recipe for pickling green tomatoes and thought I should give it a shot, seeing as how I love pickles and all. 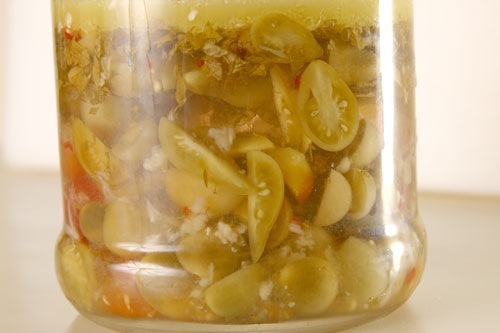 The pickling brine has a lot of the same flavorings that go into Italian dressing. These little pickles taste great on sandwiches. I didn’t have all the ingredients like mint and basil, so I subbed in some oregano and thyme. I also didn’t have 1 pound so I down converted it a bit. My version came out great so I would be afraid to experiment as long as you stay with the Italian theme for the brine flavorings. I also was lazy and didn’t do any of that jar boiling and sanitizing. I did give everything a good scrubbing though. Note: Tomatoes keep 6 months in the refrigerator as long as they are totally covered with vinegar after each use. In a china or glass bowl combine tomatoes and salt, cover and refrigerate 24 hours. Turn into a sieve and rinse briefly under cold, running water. Toss tomatoes with garlic, chile, sun-dried tomatoes, and herbs. Collect small jars and lids adding up to about 4 cups capacity. Wash them in hot soapy water, then immerse in water in a large pot. 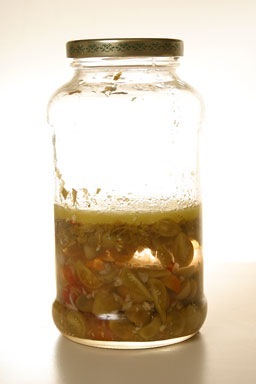 Bring lids and jars to a simmer, lift out with tongs and fill with tomato mixture to within 1 inch of jar’s lip. Add enough vinegar to cover, topping off with a little oil. Seal, cool, and refrigerate. Marinate 4 days before serving. Top off with more vinegar and seal after each serving.